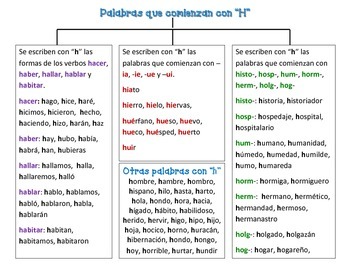 This graphic organizer includes many common words in Spanish that start with the letter "H." It lists some spelling rules and provides numerous examples. You can make copies of this sheet for students to keep in their writing folders or add words from it to your Spanish Word Wall. You can have students circle words from this sheet as they use them successfully in their creative writing.